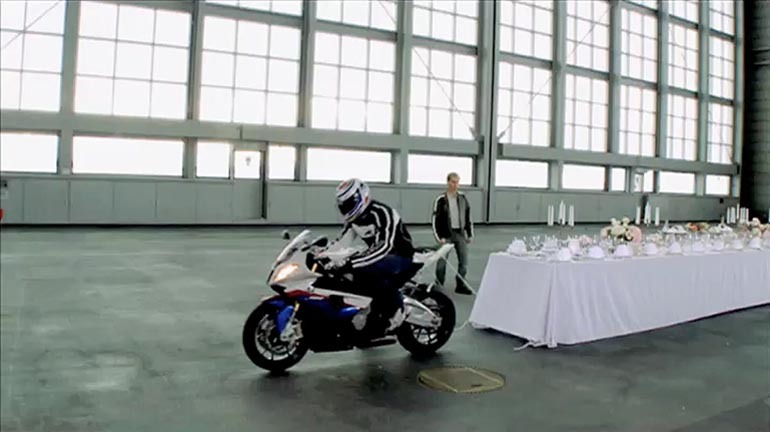 BMW has hit paydirt with the most watched BMW YouTube video ever (1.6 million views since March 5) in “Dinner for Double R”, a promotional video for the S 1000 RR superbike. Most of us have seen the oldest trick in the book, removing a table cloth from a table and leaving wine glasses and plates in place. Would it be possible to pull of the same trick on a large banquet table using a BMW S 1000 RR bike going from zero to 100 km/h in just 2.9 seconds? The video provides links to Planet Power, BMW TV (bmw.tv), and the BMW Motorrad Facebook fan page. The BMW Dinner for Double R ad was developed at Serviceplan, Munich, by executive creative director Matthias Harbeck, chief creative officer Alex Schill, creative director/copywriter Oliver Palmer, art directors Therese Stüssel and Jutta Steinberger, and agency producer Maik Schmidt. Filming was shot by directors Hondo Ratkovic and Max Nüchtern via The BrainstormClub, Munich, with producers Yves Peitzner and Dalibor Tomasevic.